Dual Valve Used for grade separation. An alternative method of trim removal that is gaining popularity involves setting the duct in an underground trench. At pick-up points, the trim falls from the diecutter onto the top of the rotating vanes of a rotary valve. The valve rotor is set below grade but above the top of the underground duct. Providing the differential pressure seal is a Neoprene wiper tip running along the entire length of the edge of each blade. The rotation of the rotary valve (usually 9 to 12 rpm) allows the trim to settle between the blades and fall into the underground duct. A paper scrap rotary valve is similar to a material-handling rotary valve (or airlock) found beneath screw conveyors and baghouses. On an airlock the seal provided by the edges of the rotating blades (or wipers) allows materials to fall through the unit without experiencing blowback from the higher pressure area below the airlock outlet. A paper scrap valve operates on the same principle allowing trim to fall from the plant floor into a higher pressure underground conveying line. The main difference lies in the shape. Unlike airlocks, paper scrap valve inlets and outlets are much more rectangular than square because of the length of the rotor is elongated to span the entire length of its diecutter (often 8 feet or more). The widths of the trench and paper scarp vale (usually 24 to 30 inches) are made to accommodate the diameter of the underground duct (usually 16 to 18 inches). As many as five or six diecutters can be placed in series to feed the same underground trench. 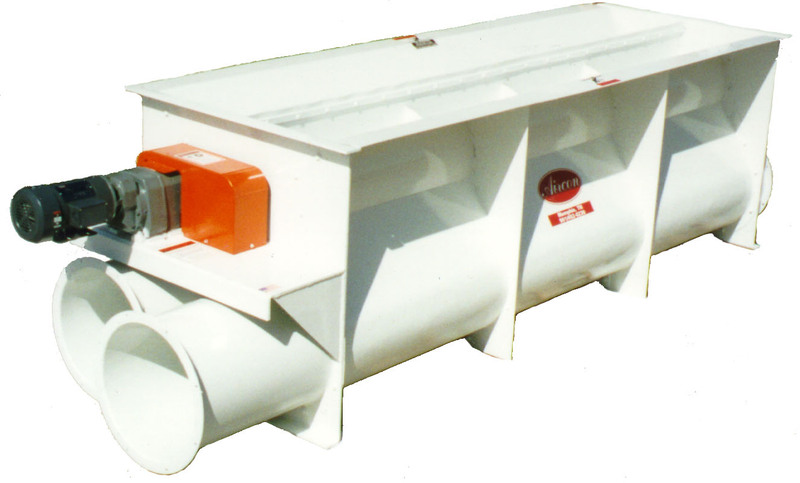 Paper scrap rotary valves also can be designed to feed two parallel underground lines for grade separation. A clockwise rotation of the valve would feed one line, while a counterclockwise rotation would drop trim into the other line. The underground rotary valve concept might be less feasible with existing plants if new underground trenches must be constructed, heavy diecutters must be relocated, and concrete removed and redone. It is more likely to be included in the drawings for new facilities where it can be considered in the initial plant design and layout. A tremendous advantage of the valves is that they steal only a small amount of conditioned air from the plant as trim falls into the rotary valves. The valves are gravity feed, not suction feed as is the case of a conventional overhead duct system. The air needed to convey the material in the underground duct can be completely taken from outside and retuned to outside. The result may be noticeable energy savings for some high-altitude locations during the winter months.